I haven't seen them yet, but apparently they have arrived. Good looking boots. Just a shame they don't go up to a size 9. Despite having a zip from the foot arch to a mid-calf position, the ankles are loose, as is the bulk of the shaft. Not flapping around in the wind loose, but not anything close to 'fitted'. I did think to cut the shoes out of the shaft material as the 'shoe' fits so well, but the soles are paper-thin. This is a nightclub item, or bedroom attire, not serious walk-anywhere footwear. They appear to be well made though, and I would think good value for money in other circumstances. If I can make time to take a photo tomorrow I will, but they are going back. 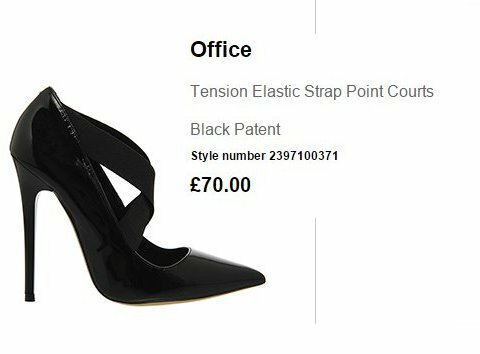 The Office patent shoe with 5" heel previously priced at £70, has gone on sale at £32 !!!!! That's a pity. With a zip they should be very well fitted. The boots do very much look like shoes with leggings attached, which (from your description, Freddy) is how they are apparently constructed. 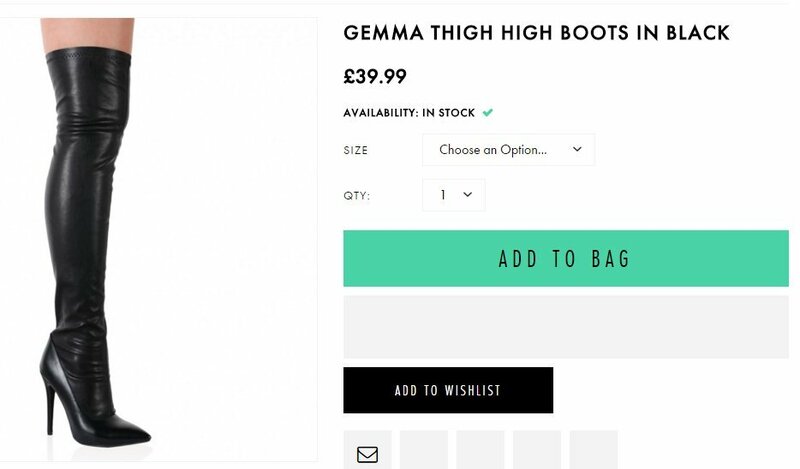 Is that why you liked them, or are you really wanting a more conventional 'one piece' thigh boot? If the former, it seems to me that you are not really gaining anything that close-fitting leggings worn with court shoes would not provide. I had hoped the stretch function, and them being a slim fit to start with, might have put them on a par with the Zara boot? Which I know to be very slim and very stretchy, possibly why they are priced at £139, not £39? This isn't a big deal for me this time, as the shoes fit so well. The Zara version has the same, shoe+sock design. While it was some time ago, I did once own a pair of heels from Honour, that were completely 'sock' material with no reinforcement/support around the foot. They were high, and made of stretch black shiny material all over. They felt like a slipper, and were extremely unstable because of that. I owned them for literally days before moving them on. Black/shiny/high, they sold very quickly. The shoe plus 'sock' taken to an extreme .... Removable shaft? These are terrifically popular with men for some reason, that I suspect is routed in historic association. Design your ultimate fetish look, how could it not include high heeled thigh boots? Plus, you don't have to have shaved legs to feminise them (legs). Are they not (almost entirely) fantasy? Though fashion and girls seem to love them - if they can get a pair that fit! Custom, or made to order, would be the only way to go. Expensive, but perhaps worth it if it scratches the itch. Cheaper to buy ine perfect pair than have ten 'almosts' and many more that are sent back. But you are fundamentally correct, in that the best chance of me getting something that fits, is to have it made. This is larger picture (made from a composite) that has been ever-so-slightly compressed, as the original looked to have been stretched. Shocking creases ... £737 - in a SALE! I don't think I need to add a further review. The images speak for themselves. I should mention the heel isn't 5 inches, it's a very wearable 4¾ inches (120mm). Somewhere I have mentioned/illustrated a pair of OTK boots from the defunct Payless Priceless, which were the boots that got me back into wearing a heel. I really liked them, but they wore out in around a month. Those soles look identical to the Payless product. Name amendment. Thank you Puffer. Hmmm. I think the boots do speak for themselves, and they look neither one thing nor the other 'to boot'. As to the earlier purchase, do you mean 'Priceless' (in UK, and defunct part of Stylo-Barratt) rather than 'Payless' (in USA and certainly not defunct)? I have a couple of pairs of Priceless boots; the quality (and fit) is pretty good, although I can't vouch for long-term wear. 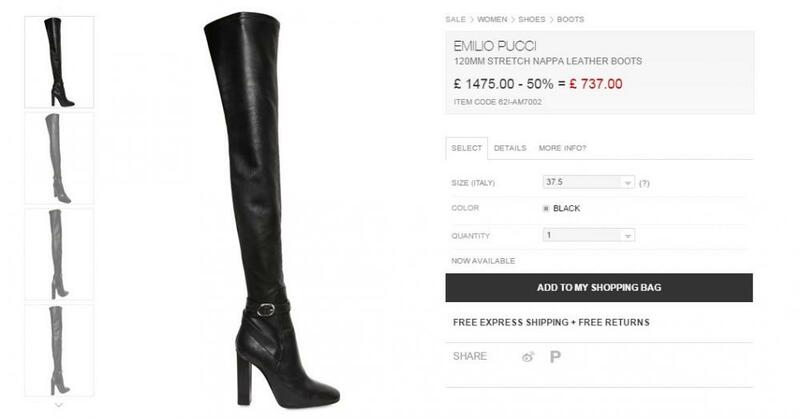 Those £780 boots, maybe they should of used another model where the might fit be better. As for the other pair.I take it you be sending them back. 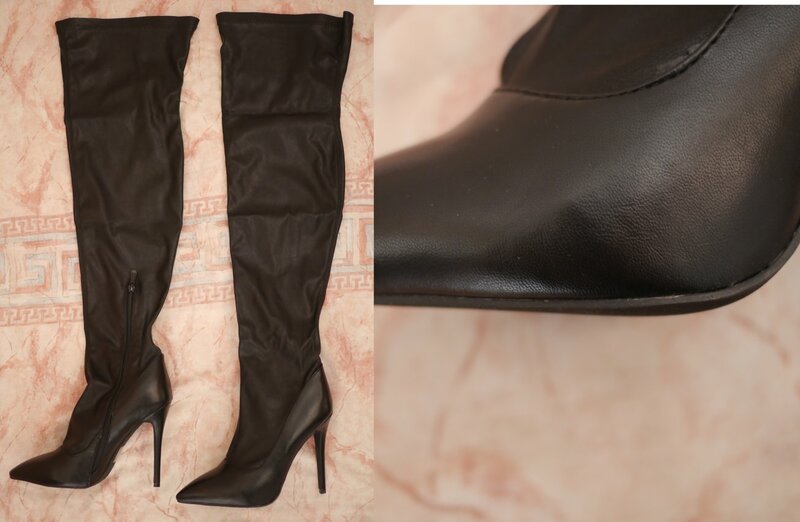 I might if I have the time take few photos of me wearing OTK boots and how well they fit on me.I have 2 pairs. I did indeed and have amended my post to show the correction, thank you. For the price, they would otherwise be an acceptable purchase, provide their limitations were understood. "Otherwise" meaning; if they fitted correctly. They are what Mrs Freddy might describe as a 'disposable fashion item, worn very occasionally by a young/inexperienced buyer' who might have low expectations anyway. For me, I expect a shoe purchase to last at least 3 months with continual daily use. Anything less suggests a poor purchasing decision on my part, and a loss of a repeat customer for the seller. I purchased some leather soled mens shoes from Clarks, some 25 years ago. As was the way in those days, after a couple of days use (to scratch up the soles) I had rubber covers put on the soles. I would have had this done to about 10 pairs by this stage, all without problem. I had always felt it necessary, given our fairly wet climate. The conclusion reached was that I got a refund, other customers/potential customers in the shop got damaged ear-drums, and those others in the mall were tempted to call the police to stop a murder being committed somewhere. I had advised the chappie, that if rubber additions were going to prejudice the sole of the shoe, I should have been warned of it at the time of purchase. I was not. On the basis that I wasn't warned, I got a refund. I have not bought shoes from them since, nor will I ever. And, I do my best to stop others buying there. They are not the retailers they used to be, nor allude to be. Shocking creases ... £738 - in a SALE! 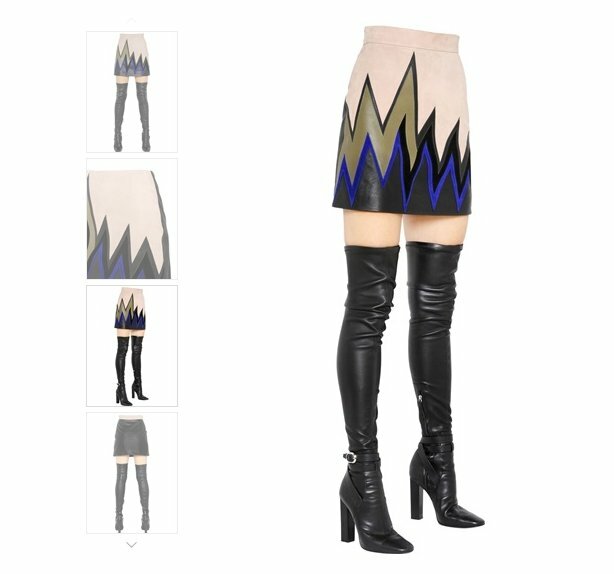 ------- It's the SKIRT that costs £738. The price of the boots isn't stated. A more detailed/supplemental post added below. This pair of boots are from Tilly of London. Paid about £40 for them. Bought in a size 10 and still have pain after a while in my right foot. If you go to http://www.luisaviaroma.com/index.aspx#ItemSrv.ashx|SeasonId=62I&CollectionId=AM7&ItemId=2&SeasonMemoCode=sale&GenderMemoCode=women&CategoryId=&SubLineId=shoes&utm_source=CommissionJunction&utm_medium=affiliation&utm_campaign=Lyst-US&PID=3852549&AID=10621891 it seems clear that the boots are £737 net and the skirt (separate item) is £738 net. But the boots are only shown as available in a 37.5! 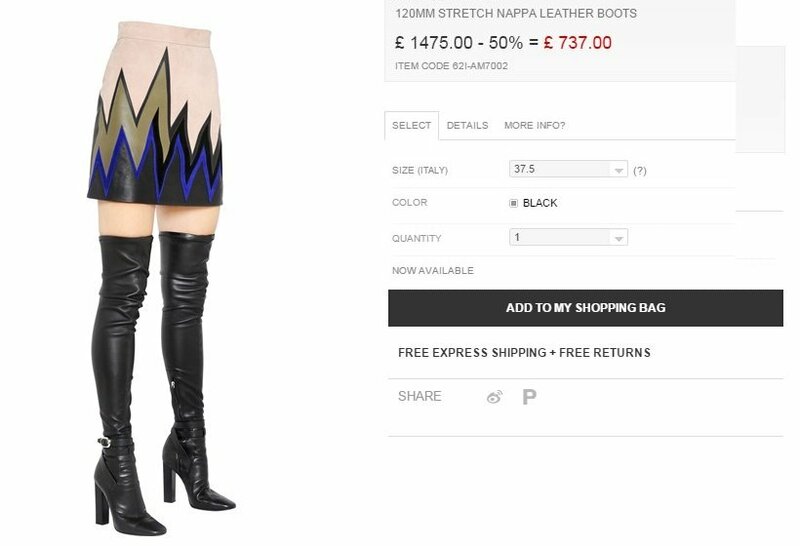 it seems clear that the boots are £737 net and the skirt (separate item) is £738 net. But the boots are only shown as available in a 37.5! 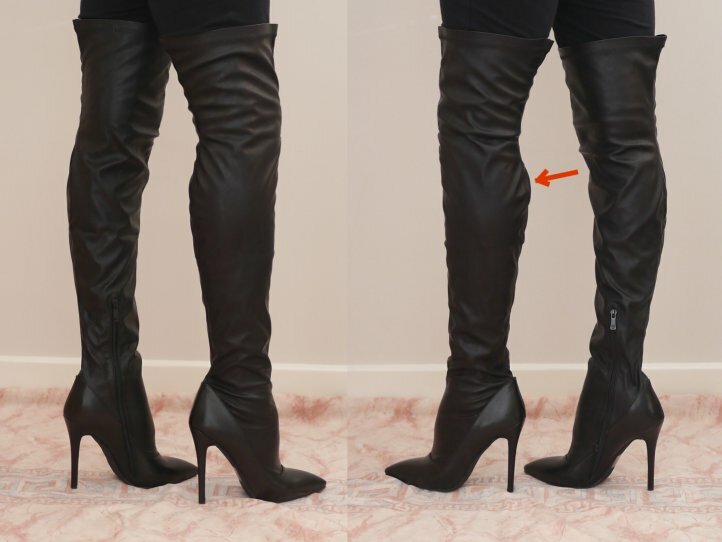 The reason for posting the picture at all, was to indicate that a £1475 leather boot from a well known designer, might not fit any better than a £40 plastic boot. I used the wrong title for the picture (I didn't copy the titles/prices from the boots over to the skirt and boots picture - and it was the skirt and boots picture that I wanted to use), the purpose of the picture (that also had the skirt in it) was to show how badly a £1475 pair of boots could look. I'd missed the absent title change because the sale selling price (£738 vs £737) was so close. Size availability, the skirt, even the distortion (picture stretching), all distractions. Same picture as the Tilly boots, surely? Lets see if I can get it right this time. i can't if tell if they the same boot in both photos in my last two posts.
. First pictire New Look. Second picture Tilly of London. The Tilly's seem to be a slightly better fit, but you look to have a similar problem to myself; slim legs? Email from ASOS late yesterday; "Sorry but ..... Out of Stock." Is there a conspiracy? Got my hands on a pair of these this week. ASOS must have had a pair returned. Looked good, with 5 inch heel (almost) ..... But getting them on? A shame they didn't fit, Freddy, after your frustrating wait. If they were returns, maybe they have been 'doing the rounds' (and will continue to do so) amongst those who are a size 8 and, reasonably enough, expect something labelled 8 to fit. What is the connection between New Look and ASOS? 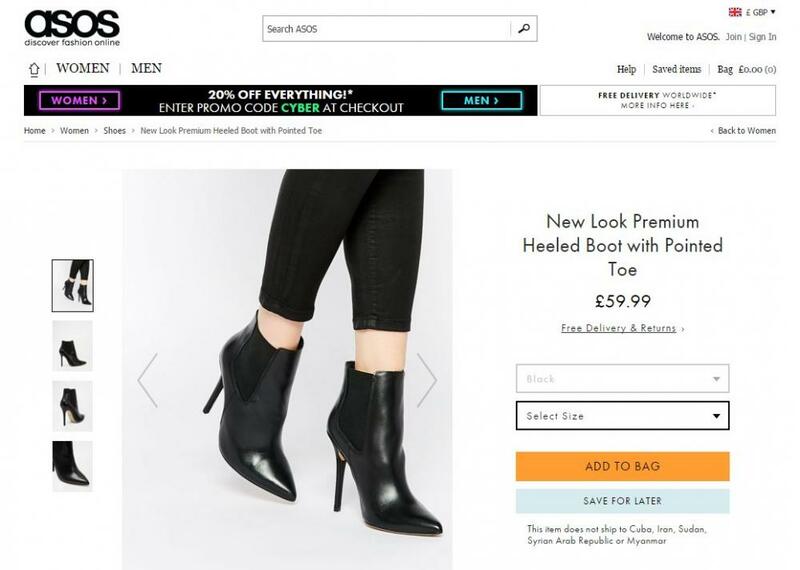 Are these boots also stocked by New Look (shops)?